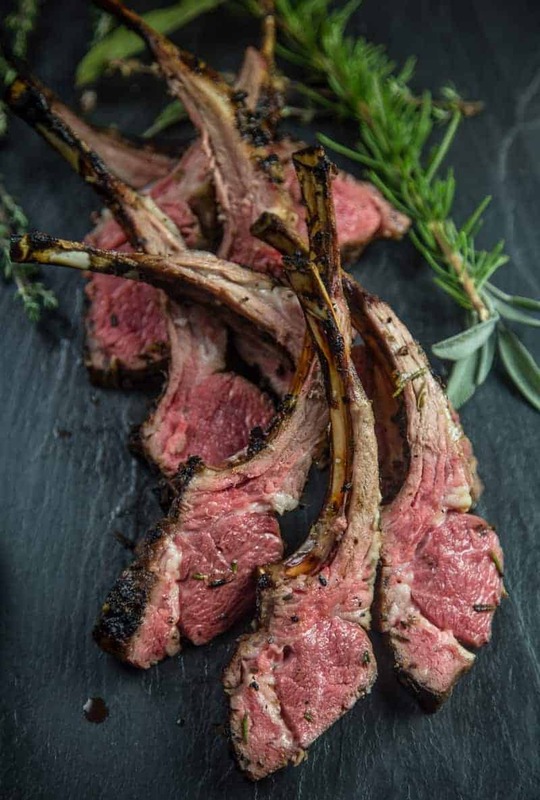 These Smoked Lamb Chops are smoked then grilled hot and fast and cut into individual lollipop portions for an elegant appetizer or serve two per person for an entrée. Don’t be intimidated by lamb. These are easy and absolutely delicious and one of the most flavorful cuts of Lamb. When smoked, it really balances out the traditional gamey flavor. Lamb is one of my favorite things to make for a dinner party or date night in. It’s also one of the most requested items we get for catering events. It’s easy to see why. These smoked lamb chops (also referred to as lamb lollipops) are filled with amazing flavor. And if you’re scared of the slightly gamey nature of lamb I can assure you some of that is tamed by the sweet smoke and herb crust. The added texture and flavor from grilled lamb is also a great finishing touch, basically making this a reverse sear style of cooking. Plus these flavors are pure fall to me with all those fresh herbs! Yum. What’s the difference between a lamb chop, frenched lamb chop, or a lollipop? Essentially we are talking about the same thing here. 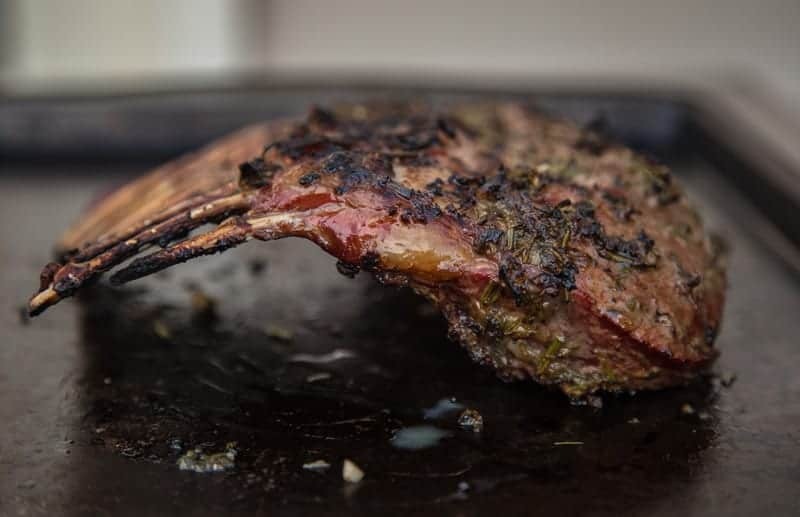 The chop can be from the rib or toward the shoulder, while “frenched” lamb references the trimming of your rib meat to expose the bone predominantly for presentation sake. A lamb “lollipop” is specific to a rack of lamb, or lamb chop, that is served with just one bone versus the whole rib. It’s great as a finger food because you can hold it by the bone (hence lollipop), or served on a dish. To prep your lamb chops simply trim any excess fat. Trimming any excess fat allows the smoke to infuse and get a nice bark on a short cook. Lamb chops cook fairly fast on the smoker (even set to a low temperature), so that fat won’t all render out if you leave it all there. So trim away. *Pro Tip: Buy them already frenched if you can! It’s no easy task 😉 to get all those bones trimmed and clean. What herbs or seasoning to use for lamb chops? Fresh herbs and lamb go together like peanut butter and jelly, so we’re making a paste out of our favorite herbs with a touch of sweet. 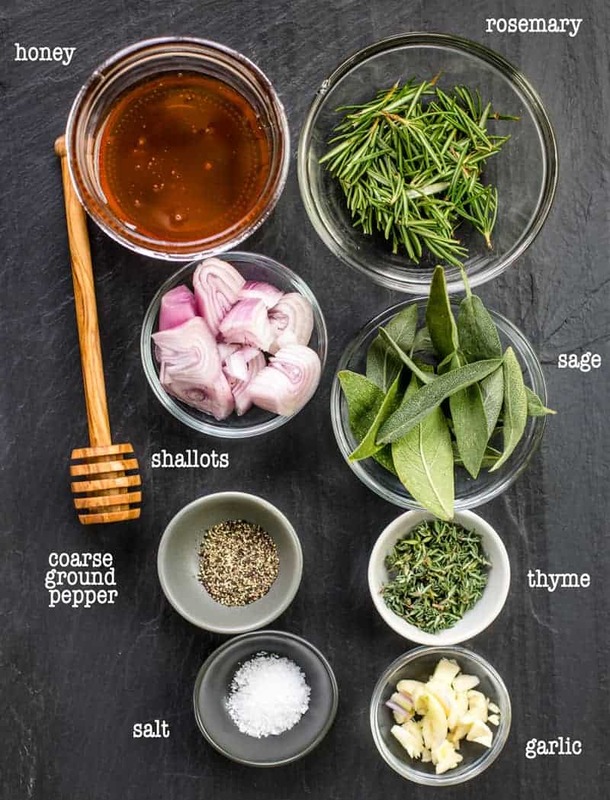 I like the combination of sage, rosemary, and thyme (feel free to add some parsley if you’re feeling the Simon and Garfunkel vibe), with some garlic, shallots, salt, pepper, honey and olive oil. Apply the paste liberally to your lamb chops. Next, you’re ready to smoke the lamb. 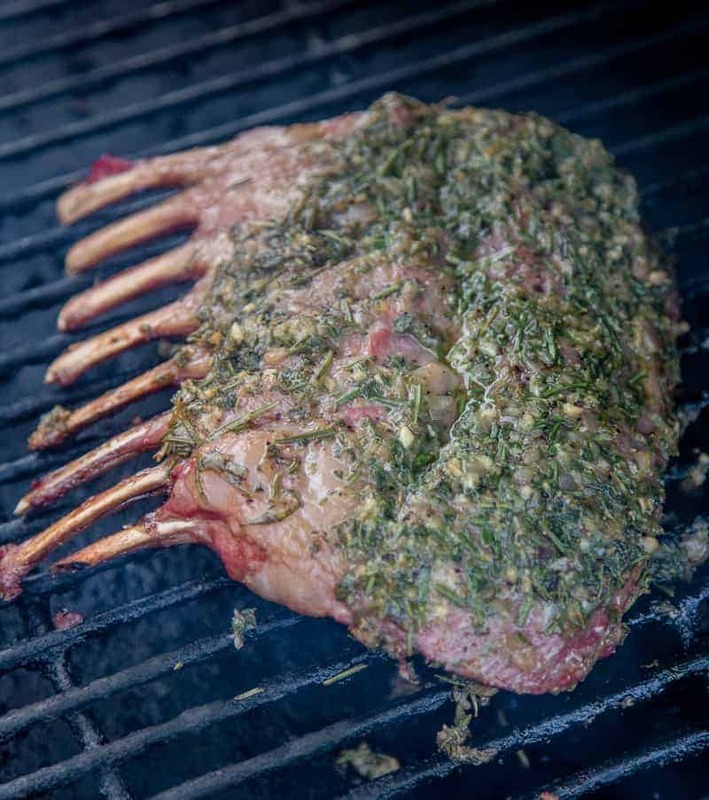 How do you smoke a rack of lamb? First of all while we plan to serve the dish in individual chops (or lollipop), we’re cooking it as a whole rack. We want to focus on a moist interior, and smoking the lollipops (the rib rack as individual cuts) separately dramatically increases the likelihood of over cooking. So keep the rib rack together to ensure a consistent cook. Set your smoker to 225 degrees using fruit wood (we use PNW apple). You can do this on whatever smoker you have (whether an offset, pellet grill, or kettle grill). For these we’re doing it on our Big Green Egg for simplicity of going from a low smoke to a high heat for the finish. Next, you’ll want to place the coated lamb on the smoker and cook for around 45 minutes, or until the internal temperature of the center of the rib rack is 120 degrees (F) internal temperature (IT). Then pull the lamb, and increase the heat. Get it hot and set it up for direct cooking. If you’re using a pellet grill raise the temperature to 400 degrees or the high setting. If you’re using a coal based grill, get the charcoal glowing. 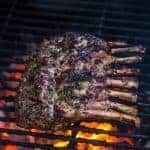 Once the grill is nice and hot, place the lamb back on the grill, just to get a nice sear on the outside of both sides. This should take about two minutes per side. If you want to test the meat for doneness look for 125 degrees IT for medium-rare, and about 145 for medium-well. 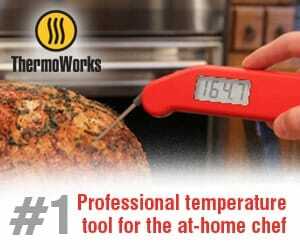 Always use a good instant read digital thermometer for exact temperatures. 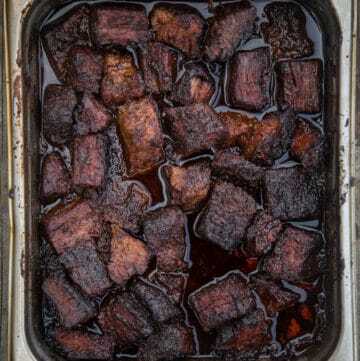 *Note: if you are cooking to medium, keep the meat on the smoker until the IT reaches 135 degrees, then transfer to the final step, and sear until the meat reaches 145 degrees. The photos you see in this picture are cooked to medium rare (ah-yeah, baby!). Alternatively, you can finish this step on a hot cast iron pan. We’re basically looking to seal in all of those flavors and finish with a nice crust on the outside. Finally, once the meat has rested for about 5 minutes, cut into individual chops (or lollipops, pictured above). Smoked Lamb Chops cooked on the smoker then finished grilled hot and fast and cut into an individual lollipop for an elegant appetizer or serve two for an entrée. Prep your smoker to 225 degrees using a fruit wood. Trim off excess fat and silver skin from the rack of lamb. Combine the remaining ingredients (for the herb paste) together in a food processor and apply paste liberally to the lamb. You can do this up to 24 hours prior. 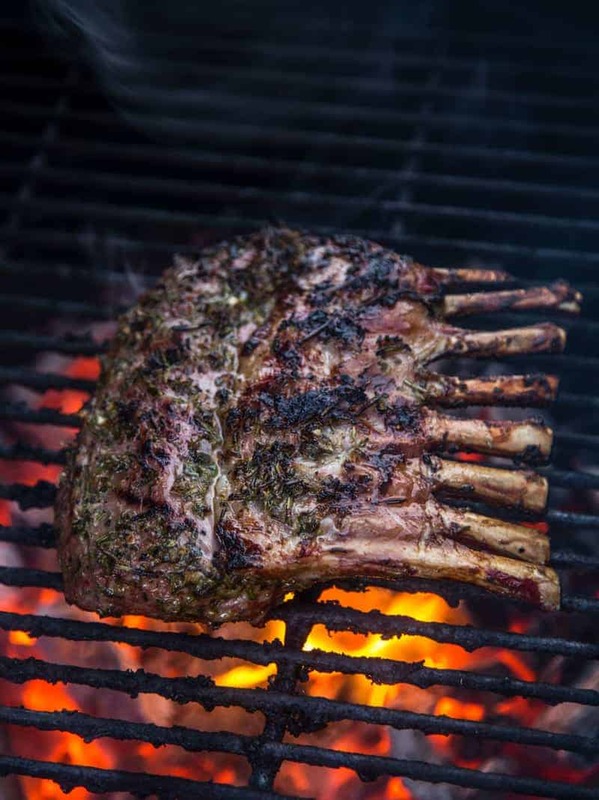 Place rack of lamb on the smoker for 45 minutes to an hour, or until the internal temperature of the rack of lamb reads 120 degrees on an instant read thermometer. (We like the Dot unit from Thermoworks for this.) Then remove and prep your grill/smoker for direct heat. Sear the lamb 2 minutes per side for your crust. Look for an internal temperature of 125 for medium-rare, and 145 for medium-well. Let it rest for about 5 minutes, then slice into individual lollipops and serve. Serve individually as a finger food or appetizer. 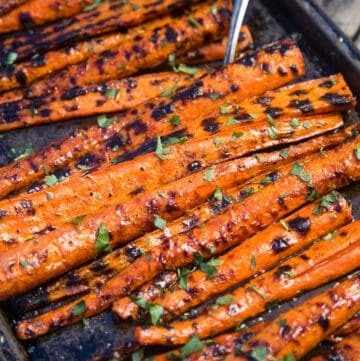 If serving as a main dish we love it over veggies or a root vegetable puree. 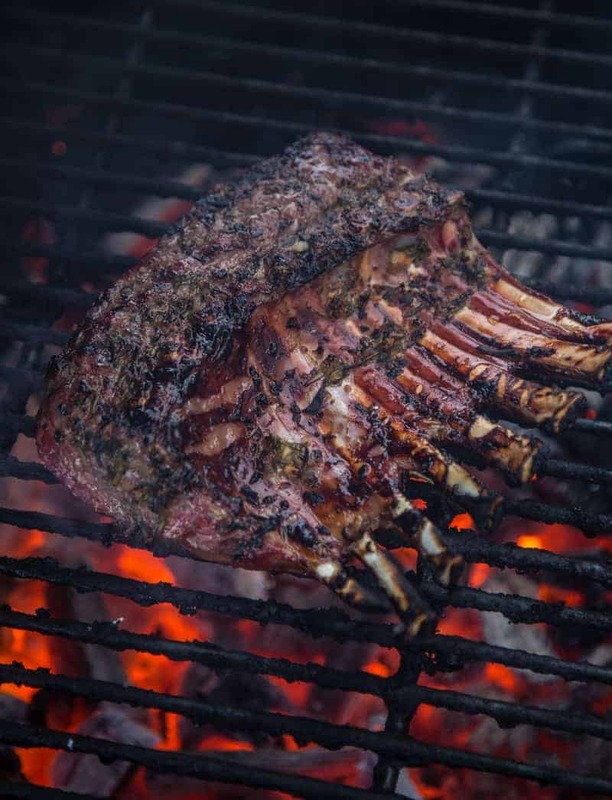 What’s the best temperature for grilled or smoked lamb? USDA suggests 145 for medium-well doneness as they define the safe cooking zone. In reality, the ranges for lamb are like beef. 115 – 120 for rare, 120 – 125 for medium-rare, 130- 135 for medium, and so on. When you are buying quality meat from a trusted source, you should feel confidant in cooking rare or medium rare. How many people will one rack of lamb serve? A rack of lamb will have 8 bones. For an entrée consider 2 lamb chops per person (1 per person as an appetizer portion). 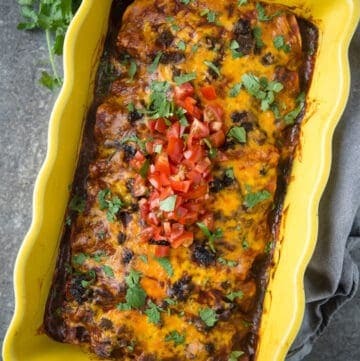 Can I cook this recipe if I don’t have a smoker? Yes! But it won’t have that sweet smoke deliciousness. 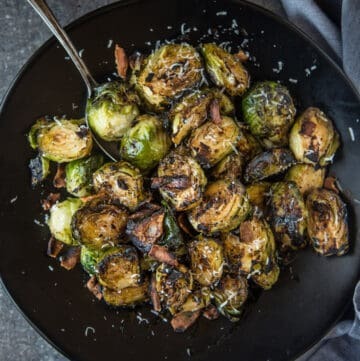 You can roast it in your oven, or cook it in your grill over medium heat. 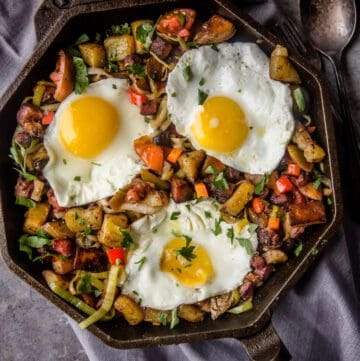 Finish on a hot cast iron pan for that crusty sear. Use the oven for the low portion, and the cast iron pan for the finish. Where do I take the temperature in a rack of lamb? 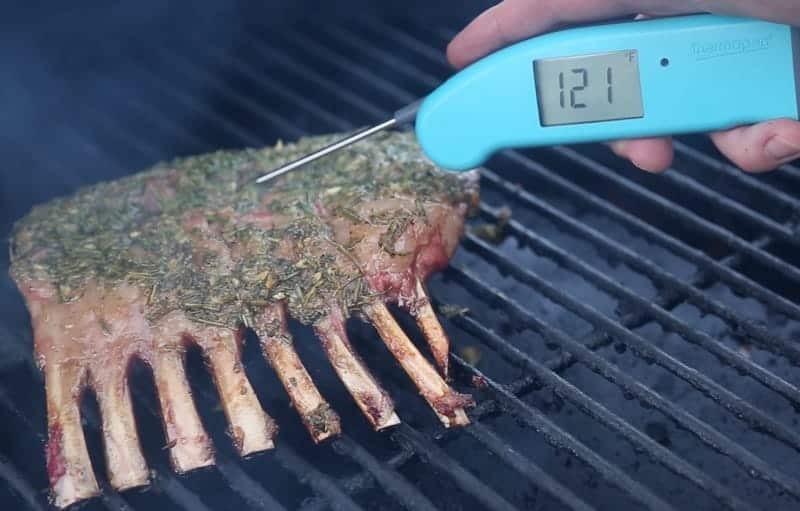 Using an instant read thermometer like the Thermoworks MK4, take the temperature in the center of the rack, inserting probe only halfway into the meat. You want to be sure you are temping the meat in the center. 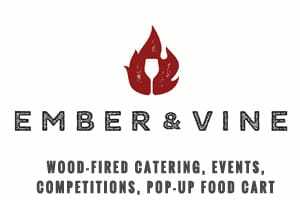 What Wines to Pair with Smoked Lamb Chops? Lamb is fantastic with a variety of wines. Cabernet Franc is one of my favorite pairings. 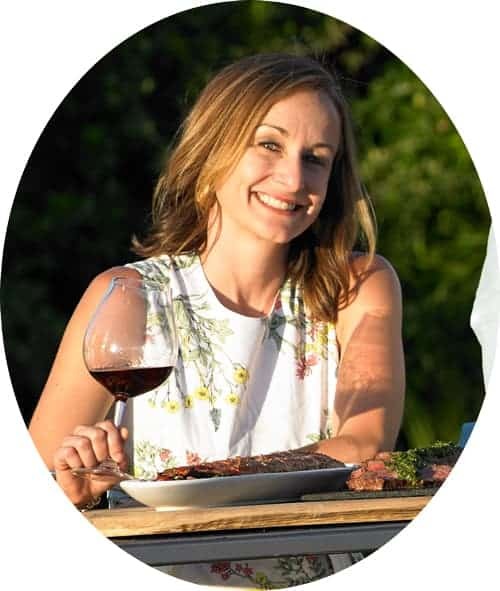 But since I live in Oregon’s Willamette Valley, I always have a few bottles of Pinot Noir around, and Pinot Noir is another excellent match for lamb (especially the bolder and darker styles). The fruity and savory components of a good Pinot pairs perfectly with the herb combo and earthy and slightly gamey flavors of the meat. Want more Smoked Lamb Recipes? Of course you do, because you’re awesome! Here are a few of our favorites. *Disclaimer: this post contains affiliate links. We only recommend products we use and love! I once went to a tailgate where Lamb Lollipops were served and I was obsessed. I think they’re the perfect tailgating food because they come with their own built in handle! Your version looks amazing Mary – Thanks for breaking things down for us! I’d drop the honey and sprinkle kosher salt on towards the end. Little sweet for me. Every thing else was great! Eric, thanks for the feedback and we love when folks alter the recipe to their own flavor!